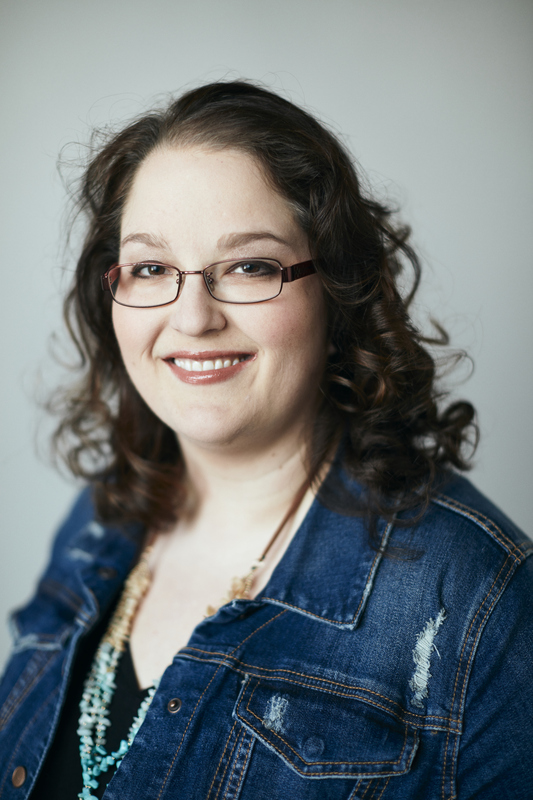 For those of you who aren’t musicians or who don’t put a great amount of time in “behind the mouthpiece” as we say, you might not realize just how intimate the relationship between a musician and her instrument truly is. Much like one does with a spouse, a musician soon realizes her instrument’s likes and dislikes as well as its tendencies. For example, a certain kind of valve oil may be the only one that keeps everything in working order, or a musician learns to compensate for a certain sticky key for so long that she eventually avoids fixing it. Yes, there is a special bond formed between a musician and the instrument that serves to express the outpourings of her to the world. Connor. Betsy Ross. Killer. Natty Bumppo. Polly. Starbuck. Subzero. Herbert. Snort. The Grinch. Mahalia. The Dark Lady. Yoko Ono. Salsa Verde. The list could go on and on, and each one would be as unique as the person and the machine she wields. Because musicians are like crazy cat ladies and one is usually never enough, most players I know have at least two instruments in their homes. While some are obvious pairings such as a flute and a piccolo or an English horn and an oboe, most simply have horns for different purposes. Yes, like Bruce Wayne and Batman and the disparate personalities they represent, some musicians can channel symphonic music only through one and must play jazz in another. Ask them why, and they’ll tell you about the range of each, the sound each produces, the tone each lends to a particular tune. They’ll tell you one “understands” a little better than the other or that one “wants it more.” Don’t panic when they tell you this; they’re not crazy. They’re just musicians…and that means they probably haven’t eaten a good meal in awhile. Also, in case you are unaware, the French horn is universally considered to be the most difficult instrument to play (be it woodwind or brass), and the oboe comes in a close second. Most schools have one sitting in a storage closet waiting for a player, and many teachers convert a trumpet or flute player when they need a warm body to attempt it. Every time I showed up at a new school, there was a great, often minimally used, instrument for me to play. I remember the day the gigantic box containing my very own horn arrived at our house. I pulled it out frantically, sending a shower of packing peanuts across the kitchen floor, and laid the case out. Let it be ugly, I thought. I know this seems odd, but I’ve always found that instruments that other people deem unattractive often produce the best sound. Typically, they’re older. They’ve been places. They’ve seen how the world works. And like a well-seasoned cast iron skillet, they know how to make good stuff. Naturally, I was thrilled when I got him. Just look! 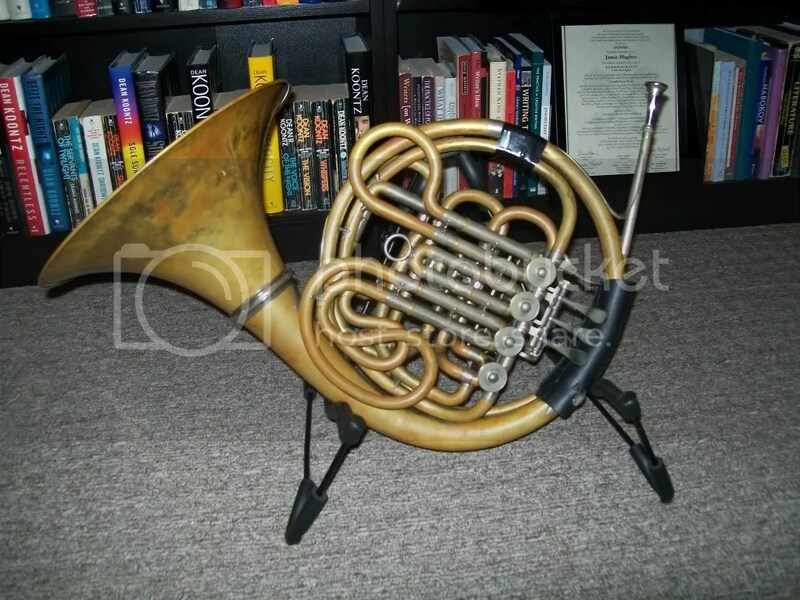 If you’re interested in some of the details, I can tell you that this French horn was manufactured by a German company called Hans Hoyer. I have yet to discern what model it is because I cannot find a serial number anywhere on it. The company’s logo is even obscured because the musician who bought it had the bell converted to detach. Yep, the bell comes off, which makes transport a cinch. However, it’s impossible to get the back third slide out when the bell is on. Hence, the same musician also had a spit valve put on. 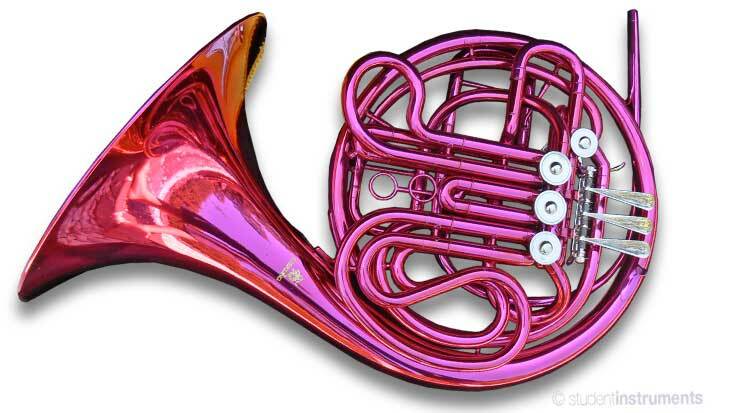 (If you’re a French horn player, you have no idea how valuable that thing is when you’re in a hurry! I can’t live without it now.) The top weld never holds correctly, so I’ve secured it with a little tape. Classy, huh? The thumb trigger is unlike any I have ever seen before, and, as you can plainly see, the horn is not lacquered. It has no shiny covering that usually attracts people to an instrument. It’s a student horn, but seriously? Hot pink? My French horn, despite my great love for it, did not have a name until recently. However, after some deliberation, I decided to give him a moniker befitting his character….Rochester. Most true is it that ‘beauty is in the eye of the gazer.’ My master’s colorless, olive face, square, massive brow, broad and jetty eyebrows, deep eyes, strong features, firm, grim mouth,–all energy, decision, will,–were not beautiful, according to rule; but they were more than beautiful to me: they were full of an interest, an influence that quite mastered me,–that took my feelings from my own power and fettered them in his. I had not intended to love him: the reader knows I had wrought hard to extirpate from my soul the germs of love there detected; and now, at the first renewed view of him, they spontaneously revived, green and strong! He made me love him without looking at me. 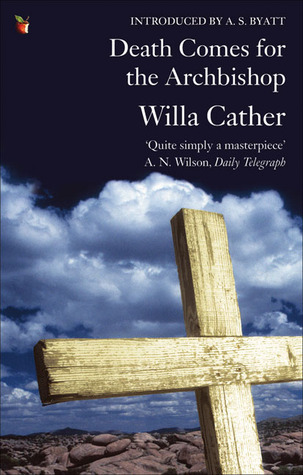 Nature meant me to be, on the whole, a good man, Miss Eyre; one of the better kind, and you see I am not so. You would say you don’t see it; at least I flatter myself I read as much in your eye (beware, by-the-bye, what you express with that organ; I am quick at interpreting its language). Then take my word for it, — I am not a villain: you are not to suppose that — not to attribute to me any such bad eminence; but, owing, I verily believe, rather to circumstances than to my natural bent, I am a trite commonplace sinner, hackneyed in all the poor petty dissipations with which the rich and worthless try to put on life. Rochester, on the whole, is one of the most hard-to-love and impossible-to-resist characters in literature. He’s dark, he has a past as well as a temper, and, above all else, he’s passionate. There’s a richness and a a depth to him that many heroes in other novels lack. He’s scuffed up and worn around the edges because life hasn’t been kind. However, the depths of his heart are seemingly endless, and there’s something about him that is wounded and vulnerable as well. 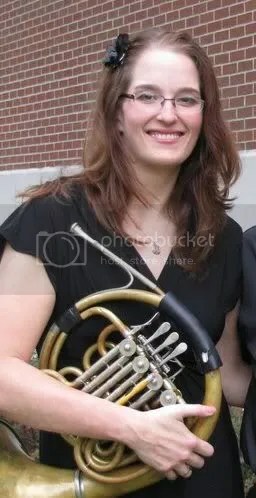 My French horn has the same look and, more importantly, the dark sound that comes out when I play (which makes me sound a lot more talented than I really am by the way) makes me think of the character after whom it’s named. Sonorous, pensive, and rich–it is all that and more. I’ll never be able to play it as well as I’d like or as well as it deserves. Perhaps my horn by any other name would sound as sweet, but I doubt it. How about you? Is there a special object–an instrument, car, or something else–that you love and have given a special name? I’d love to hear about it in the comments. Pictures are great, too!! For those of you who have never heard a French horn, I give you my favorite horn solo of all time–the second movement of Tchaikovsky’s Fifth Symphony (Andante Cantabile). Previous postWhat Kind of Tree Would You Be? He’s not much on looks, but the sound is the important thing. So “beautiful” is a pretty apropos word! 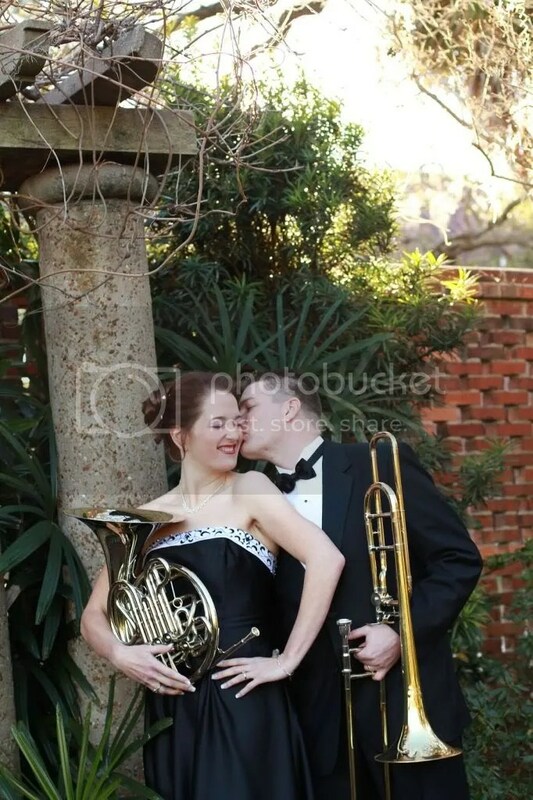 It’s clear you love your French Horn and music. Learning more about you every day. What a great post! I didn’t used to name things at all, even toys, but I’m obsessed with doing so now. Nicknames, too! OHMYGOSH!!!! I love it!! I’m a trombone player, too! Well…at least I used to be. I haven’t played seriously in years, and miss it dreadfully. I still have my trombone. It’s assembled and sitting on a stand in the bedroom. I picked it up and played a few measures of “What Are You Doing for the Rest of Your Life” on it a few days ago, just to prove to my wife that I couldn’t just pick it up and play a pretty line without some practice. It came out much nicer than I expected it to. :p I never named my horn. Perhaps I should. I’m going to have to think about that. By the way, a lot of people prefer the un-lacquered brass instrument. I’ve known people who removed all the lacquer from at least their bells to produce a darker sound. And you’re definitely not kidding about the french horn being the most difficult. My college degree is in music, and I had to take some semesters in different instruments. One of them was horn. It was HARD!! There were some notes that just wouldn’t come out. My favorite was cello. 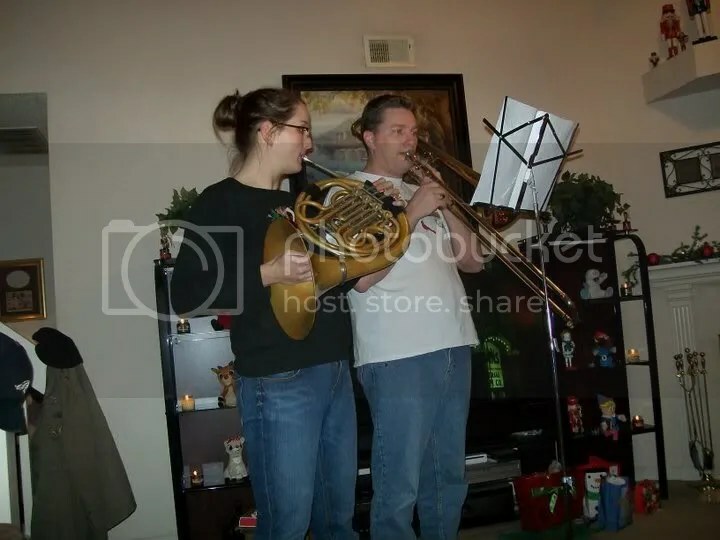 My hubby loves playing the trombone and is much better at it than I am at horn. He, too, cannot play the French horn. It and the flute are the only two instruments he couldn’t play in college. Haha. That’s funny. I couldn’t play flute, either! Must have something to do with the extreme difference in the embouchure. First off, let me say that I, too, took a long break from horn playing after college. Over five years passed before I picked him up again to play in any serious way, so it is always possible to get back in shape. Find a local horn group, a private instructor, or an amateur group to play with, and I bet you’ll rediscover the joy you took in it to begin with. I know I sure did! As for the detachable bell, you can have it converted for two hundred bucks or so. It makes carrying the thing (especially in the backpack Pro-Tech case I got) so much easier. I can open my own doors, carry things in both arms, etc. It’s lov-er-ly. And, lastly, I am certainly glad that you enjoyed the post. I had fun writing this one as it combines several of my favorite things—music, literature, and humor. I happen to have a Hoyer that looks nigh’ on exactly like yours–well, as far as valve pattern, valve caps, lead pipe appearance etc. goes, i.e., all the important stuff–and I too cannot figure out what the model is. I have a serial number rather crudely scratched in on the back-side of one of the tubes connected to the fourth valve, but that hasn’t allowed me to find the make, even so, as I can’t find a list of makes by serial number for East German Hoyers. I would be fascinated to see more pictures of your horn–perhaps the side with the tuning slides so I can see if, indeed, your horn is similar to mine–and to hear anything you might know about your horn, as it probably correspond to mine. Awesome. I might have to go back a few years and contact my horn professor at Valdosta State University as she was the one who snagged him for me when I started there back in ’97. I’ll try to get a few shots of it this weekend when he’s out of the case and send them your way via email. Thanks for the comment! You cheated on him with a Holton of all horns?